As you can see from the photo above the castle at CALMONT d’OLT at Espalion ( 12th to 15th centuries) is undergoing extensive renovations, the (partially translated) photo of the aerial plan (below) gives a good impression of what things should look like in the future. The views from up here are fantastic, overlooking Aubrac and the Lot valley. 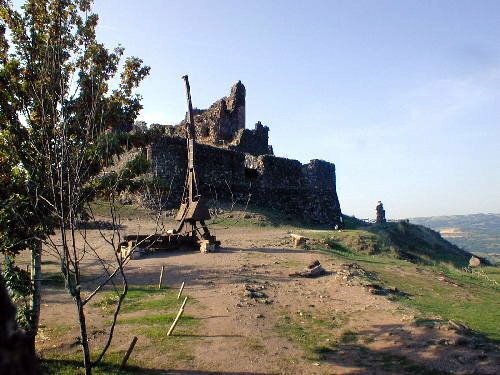 To the right in the foreground can be seen a Catapult (Sling Shot) in front of the ruins of the Castle walls. P.S. My car overheated on the road up to this castle, but it used to do that a lot, after all it was 21 years old.